Type in the url www.myresearchdashboard.com. Register or sign in with your Scopus or ScienceDirect credentials. Select your name from the drop-down list. Await the email containing your unique dashboard link (NB: This will be sent to the same email address you used to register). Technology has enhanced every facet of the publishing process - including the submission, research and editing processes - but early feedback and real-time metrics on your publications can be difficult to come by. Mendeley social usage data, which offers tips for sharing publications with peers. 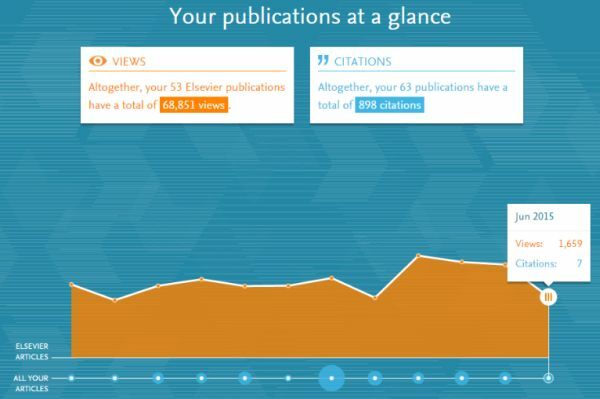 In addition, and unlike Article Usage Reports, My Research Dashboard leverages information in your Scopus profile to offer data about all of your publications - not just those published by Elsevier. Once you have registered for your dashboard, you will receive monthly updates when there are new usage or citation metrics to report on. You will also be able to access your personal dashboard at any time using a password protected log in. My Research Dashboard is the result of the combined efforts of Elsevier's Research Applications & Platform (RAP) and STMJ’s Marketing Communications & Researcher Engagement (MCRED) teams. It supports Elsevier's mission to combine data from our platforms and create tools for researchers that help them be in control of information, make valuable connections and deliver higher quality research. He adds: "We believe that it's just as important to provide services after you have published with us. We want to keep you informed and engaged, and help you discover information about who’s reading your publication that you might not otherwise know. There is nothing like it available elsewhere today." Elsevier's Microbiology Publisher Sheba Agarwal-Jans works closely with postdoctoral researchers and understands the need for early feedback. She welcomes the opportunities offered by My Research Dashboard’s Audience Map feature to identify and establish new collaborations for future papers. She says: "If you look at the country breakdown, you might find a high volume of viewing activity taking place in an unlikely country, and you can research who in the field in that location is working on that topic—who it is that might be viewing your paper. There are ways to use the metrics to help in understanding if there is a potential collaboration with either someone or a group in that country." Marcel Reuter, a postdoctoral researcher at Erasmus University Medical Centre in Rotterdam, was involved in the team testing My Research Dashboard. He says: "What is valuable is that the dashboard provides an overview of how the publication is perceived. It's useful to see the insight of communities and countries — especially when it is unexpected. Then you can decide if you'd like to contact others from those areas. The geographical information aids in understanding who the target audience is, and can help steer future publications." Find out how metrics can help you see the bigger picture in this Elsevier Connect article. Based in Amsterdam, Elizabeth Holmes has spent the best part of her career in the marketing department of STM Journals at Elsevier. She first took on a role as Assistant Promotion Manager before spending a substantial number of years as Head of Marketing for Life Sciences. She moved into her current Global Project Manager role eight years ago and is responsible for global marketing communication projects, which include communications to researchers in their role as author and / or editor. Elizabeth Holmes has an SRN, carries a Certificate in Marketing, and has more than 30 years’ experience in Marketing within Elsevier.